AutoSport will be staging its Drag and Wind Event#8 on Sunday 28th September at the ARC Car Park, Arima. We must apologize for the late notice but this was caused in part due to “interference” with my email account by person/persons unknown. As a result we have lost all ARA email contacts. I have requested those I have been in contact with to resend their email address to me, and I ask this again now, to….. rawlermx@gmail.com. The briefing meeting is carded for THURSDAY 25th September at the Chaguanas Regional Indoor Sport Arena at 7:00pm, upstairs the front Office. Should we finish our competition early, we are looking at introducing another competition with Teams of two cars running in a relay challenge – we spoke of this last year as a Bran-attack. Simply put, first car runs the complete course but DOES NOT come into the finish box. This driver pulls alongside the second car at a safe spot in a safe manner, hands over a “Styrofoam Baton” to second driver who then makes his complete run and finishes in the finish box. Yes, this can be safely done. baton race will be interesting. what happens if team driving side is mismatched? as long as it's thrown into the other car? wagonrunner wrote: baton race will be interesting. Why you think you are where you are - to come up with solutions! What if you fraid baton ? X2 wrote: What if you fraid baton ? I know men are afraid of Bailna's but whatever tickles your fancy. This should be a very interesting race. wheyyyy, can't make for this one, would of loved to do the baton race. DEVI wrote: Yup...Team liqui Moly/Suzuki will be there for the Baton Race.... comp #101 Neil Goopiesingh and comp #37 Devi Nath! Never miss a good opportunity to share some baton eh! Last edited by AutoSport on September 27th, 2014, 3:53 pm, edited 2 times in total. Two Tiida and an Almera? Nice.. Lets see how they perform on Sunday. 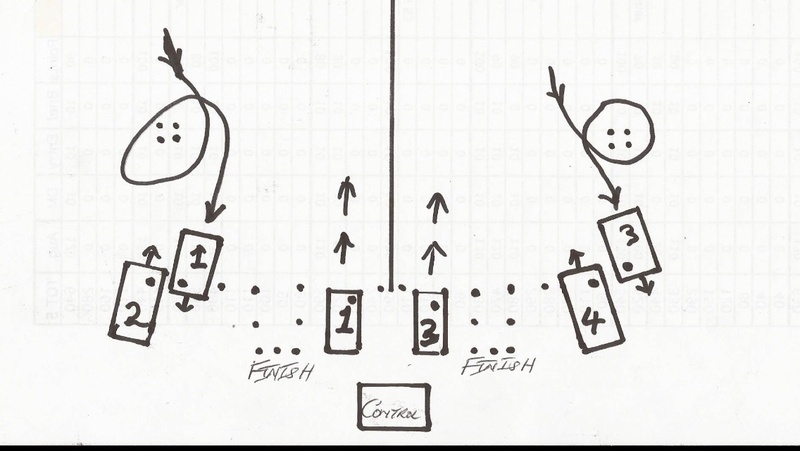 So this is draft layout of how we shall be running the Bran-Attack, time permitting, a relay with two Team cars. Any pair but NOT from the same Class. As shown in diagram Team cars are 1 and 2 on the left Lane, and 3 and 4 on the Right Lane. Cars 1 and 3 would line up and make their complete two laps but in the end SHALL NOT return to the finish box. Car 1 will return to the left of his finish box where he will hand over the baton to his Team car #2, who will then move off to do his complete run and he will return to the Finish Box. Same for Car #3 and #4. Only difference is Car#4 will be waiting to the right of that finish box for his Team partner in Car#3 to pull up to his right, and hand over the baton before he heads off. We shall try our best to ensure the safety of all. This is an experiment and we shall see how it can be improved upon and possibly used on a regular basis. Anyone knows what time this starts? Congrats to Autosport for another well staged event, despite the day's earlier challenges. The intended purpose of this event was evidently displayed on the faces of those in attendance yesterday, where competitors with their family, friends and supporters come together for a best day of fun. Thanks Aaron and Narend for pics that capture the satisfaction and expressions in all faces shown. Wonders continue to be accomplished at this venue. Them Car Park Racers Again! why you such a grumpy old man? yuh Jag on the road yet?